I am back from our week long family trip to California! We decided to do a multi-city trip to please everyone in the family-golf in Palm Springs, basketball on Venice Beach and fancy resorts with beautiful ocean views. Guess who picked the last one? If you guessed me you would be right! We were all excited about the cooler weather since the Texas heat hit us hard at the end of May. We started the first leg of the trip in Palm Springs. Well, it was actually Palm Desert. It was difficult to find a hotel to fit all of us, but we finally found a two bedroom suite. We stayed at the Renaissance Indian Wells. It is so pretty! The property is huge and there's so much to do there. The best part is our suite was enormous! We had a huge living room, dining room, three queen beds, two bathrooms, two kitchenettes and three balconies. I also liked that this was a large resort with a lot to do on property. My husband and older son took the SUV we rented to the golf course the only full day we had there so we needed restaurants and activities to keep us busy. We only stayed two nights because I wasn't sure there was enough for us to do there, but I wanted to experience it and maybe come back later if we liked it. The first thing I did was hit the pool! Only Aidan, my youngest son, wanted to go swimming since the other two were tired from the two hour drive. We didn't stay long because it was getting late and everyone is was getting hungry for dinner. We decided to eat at a restaurant on property since we were all a little tired. The minute we walked out to the pool after dinner the boys "came alive." The movie screen was set up and and they all wanted to stay and go swimming. My husband and I were zombies at that point so we promised we'd go the next day. My husband and oldest son woke up really early to go play golf the next day while the rest of us slept in. We were stuck without a car so I ordered room service for the kids. It was pricey, but I did get a kick out of seeing them have room service for the first time. Ryan, my 12 year old, actually requested it. You would have thought it was a normal occurrence by their nonchalant reaction of being brought breakfast. Ryan loving hotel life in his robe! We made it back out to the pool for a couple of hours until lunch. We were walking back to the room and Aidan ran ahead of us. We turned a corner to see him waiting for us like this! After lunch at a Triple D restaurant (Diners, Drive-ins and Dives on The Food Network), we checked out Palm Springs. Honestly, I was disappointed in Palm Springs. It wasn't what I expected based on the photos of The Parker Hotel and the mid-century modern architecture. It was rundown, but that's okay because I loved Palm Desert where our hotel was located. I am glad we only stayed two nights there because there wasn't anything except the pool that interested my younger boys, and they get bored with it fast since we swim so much at home. They loved eating out at the restaurants though! I tried to find kid friendly places, but the only one I would recommend is Eureka! because even if it is burgers and tacos it is really good. I doubt we'll all go back to Palm Desert as a family, but I know my oldest son and husband would love to go back and play golf. The next day we were headed to Newport Beach! I decided I wanted to go to Newport because one of my favorite TV shows is Behind the Gates on AWE. So many of the homes they feature are in the area. I knew the views and weather would be amazing. I chose Newport over the other local towns because I found the most amazing hotel. 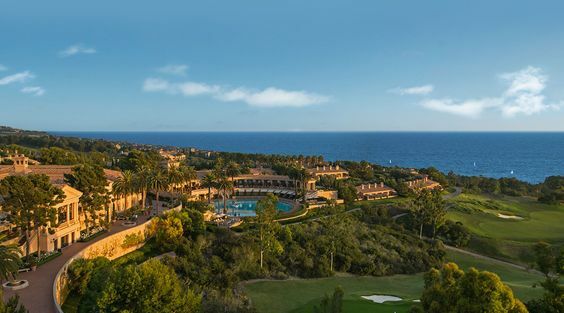 I knew it by looking at the website, but once we drove up to Pelican Hill Resort my jaw literally dropped. My kids took one look around the valet area when we drove up with the fancy cars and asked if we could really afford to stay there. I kind of had the same thought with McLarens and antique Rolls Royces parked next to us. I did get a really, really good deal there. It normally is very pricey, but the rates at that time plus a night free special made it very affordable. We really just got lucky. I didn't mention this on my Instagram stories when doing a room tour, but they also include a butler when you rent a villa. I wasn't exactly sure what to do with a butler. He even called at one point to ask how we were because he hadn't heard from us. We finally felt like we had to give him something to do so we had him make our dinner reservations. We got there early and our room wasn't ready, but we got to check out the villa clubhouse and pool. I love the decor! We took a hotel shuttle to Crystal Cove Beach to wait for a call about our room. Crystal Cove! I hear about it on Behind the Gates all the time. The shuttle driver had bags for all the guests with beach towels and bottled waters, which was perfect since our beach gear was packed up in the car. Now this is where the butler came in handy. The hotel called and said our room was ready while we were at the beach. Instead of taking the shuttle our butler offered to come pick us up and take us to the villa. No check-in either! Can I just live here? Our view of the ocean was blocked by trees unless I stood on the chaise lounge, which I did of course. We had a living room, dining room, full kitchen, two bedrooms and three bathrooms. It even had a foyer! The butler sent up a nice cheese, bread and fruit platter that evening. The kids have since rediscovered fruit. It got cool that night so we took full advantage of the fireplace. We explored the area the next day-Dana Point and Laguna Beach. We even drove down to La Jolla in San Diego for lunch since it was only an hour away when we were in Dana Point. The boys were not happy driving around so we kept that short. We went to Laguna Beach so Ryan could play basketball and Aidan could go to the beach. It was cool and gray, but that didn't stop them! We all had such a good time. We met a local and chatted while Ryan and his son played basketball together. The next day we were supposed to go to Catalina Island, but it was another cool and gray day. Our only indoor activity was to go to Griffith Observatory in LA. We were up early already so we decided to drive there instead. We ended up getting there way too early because it wasn't open until noon, and actually never ended up making there. We spent forever in traffic finding a restaurant and then the boys decided they wanted to stop in Hollywood. They don't know many celebrities, but they liked how exciting the area seemed. It turns out Jimmy Kimmel was about to start filming. Sandra Bullock and Kobe Bryant were the guests. You already know I have a son obsessed with basketball so I felt terrible I didn't get tickets ahead of time. At least we took this picture outside the set! I thought it was cool how the Hollywood sign can be viewed here. The restaurant was in Beverly Hills and my husband made sure to walk me by my favorite spot from a trip years ago. They had the display on the street so I had to get the boys to take a picture. I have to tell you the funniest story! We were leaving the parking garage next to The Jimmy Kimmel show right before they started filming. The parking garage attendant directed us toward the alley between the garage and show building. I guess this is where celebrities get dropped off because there was a crowd of people on both sides of our SUV waiting, which happened to be a large and black. I looked up and these people had these ecstatic expressions. Some were even recording us on their phones. My husband started dying laughing because he realized they thought we had a celebrity in the back of our SUV. The boys were dying laughing too! My husband asked me if we should stop the car and let our older son out and see if they thought he was a celebrity. I said no, but it would have been funny! I have to say that if celebrities get that kind of attention it's pretty cool. These people were seriously thrilled to see us! Thankfully, the next day was sunny and warm! I think this was my favorite day. We stayed in the Newport area because we were DONE with the traffic. We went to Balboa Island. It is so adorable! The beach, homes, shops, and restaurants are picture perfect! The boys rode on the Ferris wheel at the pier after lunch. Dylan being the big brother he is had to rock it to scare his younger brothers. I think this was a day we all had fun together as a family. Maybe it was the sunshine or the view? I don't know, but it was a good day. We ended it with a nice dinner that ended up being my favorite place of the trip. Javier's-Not everyone liked their food, but it didn't go to waste! The decor was beautiful. 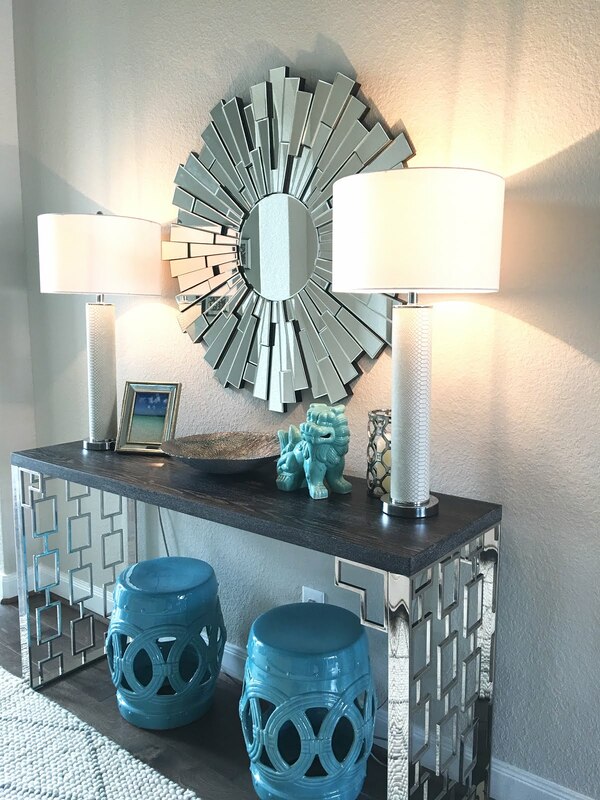 I love these lanterns! The next day was our last full day so we decided to check out the hotel pool. You can see the golf course and the ocean in the background here. What an amazing view! Even though the pool in Palm Desert was nice it was so crowded that we couldn't relax. This was so calm and almost spa-like in contrast. I would pretty much curl into a ball if I were at one of those crowded pools in Las Vegas. Just the photos of that many people makes my anxiety spike! We left after a couple of hours to get ready for a date night. We ordered the boys room service for the second time. It was outrageous, but I consoled myself by reminding myself it was vacation. We made reservations at the Italian restaurant at the resort. The best part was the view. I was sad to check out the next day! Here are some other cool things from our trip. The Quiet Woman-I was just sitting in traffic and looked to my left and noticed it. If you are a Real Housewives of Orange County fan you will know the significance of this restaurant. This is where a fight (verbal) went down between Kelly and Shannon. My kids wanted to know about it so they looked it up on Youtube and got a big laugh out of it. I also found my dream house! It has an amazing ocean view too! We were headed to Santa Monica next for our last night. This was the boys absolute favorite day! They loved the beach and the rides at the pier. We let the older boys go on the rides while we had lunch at Shutters nearby. My little guy isn't a fan of rides, which worked out since he's still a little young to go even with his teenaged brother watching him. After lunch my husband went to follow the older boys around and I took Aidan to the beach. They met us after a while and all went in the water...until I saw a fin not far from the boys. I freaked out! We kept seeing fin after fin even if not at the same time so it was probably a pack of dolphins, but they were way too close for comfort! The weather was perfect. It was warm enough to sit on the beach, but we weren't sweating either. We still had all afternoon to kill so we decided to head to the Venice canals. I have always wanted to check them out. My older two boys stayed behind at the hotel, but that was probably a good thing because I can't see them enjoying it. We didn't stay long, but it was nice to see. That night we had dinner by the pier and the boys rode a few more rides. Aidan even decided to get on one of the smaller rides! The next day we were leaving, but we had the most important stop to make. Ryan had to check off playing basketball on Venice Beach off his bucket list. He's been talking about it for years! We heard it gets kind of crazy so our plan was to wake up at 6am and take him there. I didn't sleep that night (random insomnia) so I stayed behind to get rest while my husband took him. They were the only ones there so he had the court to himself! I am so sad I wasn't there, but I am so happy we could do this for him! It was the main reason we chose to go to California. I can't wait to blow this photo up and hang it in his room! I hope you enjoyed my California trip report!